Plastic is causing some serious damage, just ask the EPA. Maybe the best way to describe plastic is to point out the obvious, it’s so prevalent it is literally found everywhere. It clogs rivers, streams, oceans, and landfills all over the world. Imagine floating, plastic islands in the oceans. What began as convenient products became a monster to ecology. With such an immense problem, what can one person/one family do? It’s best to just begin. Make small, sustainable changes, pass it on and continue to encourage the commitment. 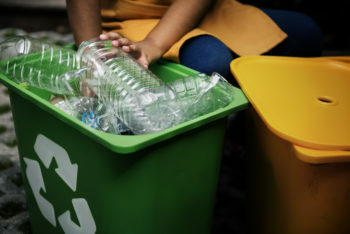 Here are a few basic tips to start cutting back on using plastic. We don’t realize how much plastic is involved in our grocery shopping. Carry your own reusable bags and buy loose produce instead of those in plastic bags or wrap. Gradually cutting back will become a lasting habit. Keep leftovers in plastic and glass bowls you’ve already purchased. Mindfully make a note to avoid buying any more plastic containers. Don’t drink from Styrofoam cups. Not only does Styrofoam make a huge contribution to the overflowing plastic refuse problem, but the chemicals Styrofoam is made from are dangerous to our health and the health of the planet. Again, we can prevent accumulating further waste by changing a simple habit. Take your own cup from home and enjoy your favorite drinks with a clear conscience. Children are little sponges who learn by watching everything we do. Every time we commit to a simple positive behavior we save money, save the environment from further destruction and teach our children how to do the right thing. Changing habits takes some time and a little persistence but the results are vital to living a healthier life. Interested in learning more tips on Living Green? Contact us today.